Guest post by Monica Moore, Scholarly Communications Librarian, and Cheri Smith, Psychology Librarian, Hesburgh Libraries. As a member of the scholarly community, you may occasionally hear people mention the term “h-index.” The h-index is a number assigned to individual scholars that measures both their scholarly output and scholarly impact. It is a calculation based on the number of papers a scholar has published, and how often those publications have been cited. The “h” stands for Dr. Jorge E. Hirsch, a physicist from UCSD, who, in 2005, recommended using this calculation to measure impact. However, the easiest way to understand it is to think about actual examples. If an author has published 20 papers, and 10 of those papers have been cited 10 times, then the author has an h-index of 10. If an author has published 100 papers, and all of them have been cited at least 100 times, then the author has an h-index of 100. How is the h-index used? Many universities, including Notre Dame, use the h-index as a part of the promotion and tenure process. It is most heavily used in the sciences and social sciences, as these are the disciplines that are most likely to generate publications that are frequently cited. Works of fiction, poetry, or art are not typically cited, so their impact should be measured in other ways. If you are in a science or social science field, it is a good idea to keep track of how often people are citing your work. 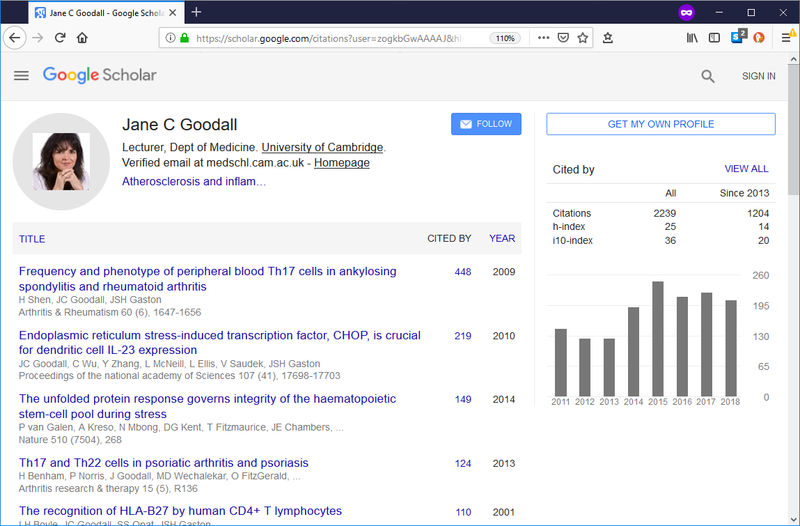 You can set up a profile for yourself in Google Scholar, Web of Science or Scopus, and attach it to your ORCiD so that your publications are disambiguated from other publications from authors with names that are similar to your own. This way you can easily help colleagues, employers, or potential employers see the measurable impact you’ve had in your discipline. Where can you find the h-index for an author? In order to calculate an author’s h-index accurately, you would have to have a list of all of the author’s publications and know the number of citations to each of those publications. There are several resources you can use to make this easier: Web of Science, Scopus, and Google Scholar. While Google Scholar is a freely available resource which indexes content on the open web, Web of Science and Scopus are library subscription indexes that are available to all University of Notre Dame faculty, staff, and students. 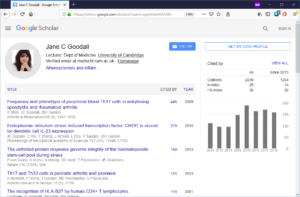 Google Scholar requires the individual researcher to set up a profile to track their publications and calculate their h-index, while Web of Science and Scopus provide a report based on the author name entered. You can see that the h-index in Scopus is different from what is in Web of Science. Why is this? Title lists, subject area, and time period coverage can vary between these two resources, which will affect the h-index calculation. For an overview of the differences between Scopus and Web of Science, you can view this guide from Boston College, or learn more about the Web of Science content coverage policy or the Scopus content policy. Another variable to be aware of is the author name itself, and any variations associated with it. While things like affiliation can help to disambiguate author names, it’s always better to search by some type of author identifier if one exists for that author. The primary example of an author identifier that is system-neutral is the ORCiD. 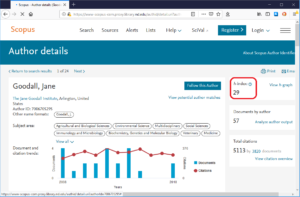 Both Web of Science and Scopus allow for searching by the author’s ORCiD, and both Scopus and Web of Science allow for the exclusion of self-citations in articles before calculating the h-index. In the above example, we can see that there is a profile for “jane goodall,” but not the same “jane goodall” that we saw in Web of Science or Scopus. 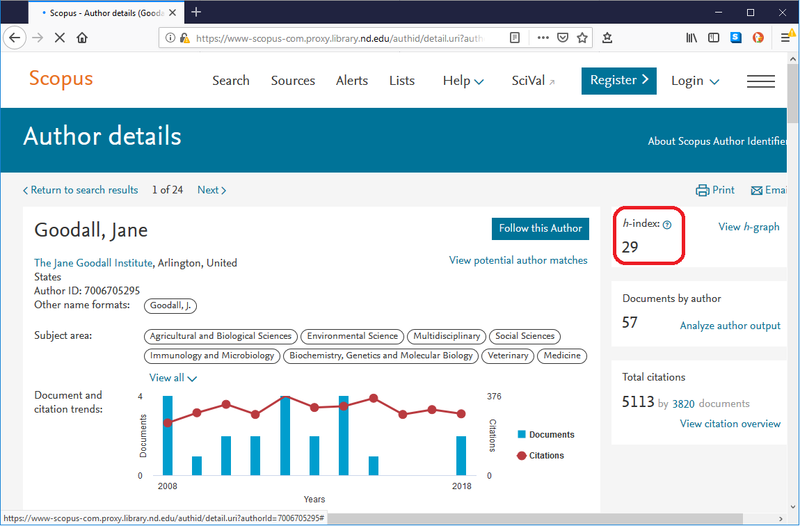 If it had existed, we might have seen another, different h-index number since the pool of publications and citation information could also be different from what is used by Web of Science and Scopus. The h-index is actually just one method of measuring scholarly impact collectively known as citation indicators, and it’s not without its critics. The difference in title coverage for the tools that generate the h-index number is one of the biggest issues, along with the need for researchers to maintain and keep up with their publication profiles in Google Scholar or monitor their citation analysis information in Scopus or Web of Science. Retracted papers that are still cited and self-citations can distort the h-index unless these are not excluded in the calculation of it. The article “Multiple versions of the h-index: Cautionary use for formal academic purposes,” provides a good overview of these and other questions related to the h-index. Perhaps the most important thing to remember about the h-index is that is just one measure of scholarly activity and impact. For more information on h-index concerns and other methods of measurement, check out this information at ImpactStory, and stay tuned for another blog entry on Altmetrics!